As corporate networks adapt to changes such as distributed workforces and the proliferation of cloud-based applications, SD‐WAN has emerged as a go-to technology solution. SD-WAN addresses many of the pain points associated with the corporate WAN, most notably high-cost, low bandwidth, and inflexible management. Ribbon's approach to SD-WAN comes from our traditional strength in supporting the needs of the small to mid-sized business (SMB) market. This segment of the market, largely underserved by the SD-WAN vendor ecosystem, value reliable performance of voice, video, and business-critical applications, as well as resiliency to make sure they’re always up-and-running. Ribbon's SD-WAN solution allows for application-specific prioritization, giving businesses the ability to segregate critical traffic over routine, ensuring a better overall customer experience. These priorities can be applied in a single link or multi-link environments, giving you flexibility in your deployment strategy. Prioritization can be set for both the destination (e.g., a video conference provider or a CRM platform) and source (e.g., traffic emanating from a mission-critical source). Multi-link performance enables routing of mission-critical voice and data traffic with the highest level of performance. It continually measures link quality, determining if any degradation is occurring, then moving traffic accordingly. This ensures the traffic you most value always finds the best path to its destination. You have complete control over the applications that have priority and how they should behave in various levels of WAN degradation or outage. SST combines application routing priorities and Multi-link performance to manage SIP voice sessions across multiple WAN connections. In degraded conditions, SST can decide to move individual SIP sessions based on the level of degradation. These voice sessions stay active during any transfer between WAN connections, virtually eliminating dropped calls and poor voice performance. Survivability adds additional resiliency and business continuity functionality to the SD-WAN solution portfolio. It includes failover functionality to analog (FXO or PRI) trunks as well as limited PBX functions in outages. These PBX features include station-to-station dialing, hold, transfer, park, and conference. The EdgeView Service Control Center is the cloud-based platform for provisioning, troubleshooting, and management of your VoIP network. SD-WAN can be fully managed through the EdgeView interface, giving service providers a single pane of glass for device management and SD-WAN control. Dashboards provide a visualization of overall SD-WAN performance as well as detailed records for troubleshooting. 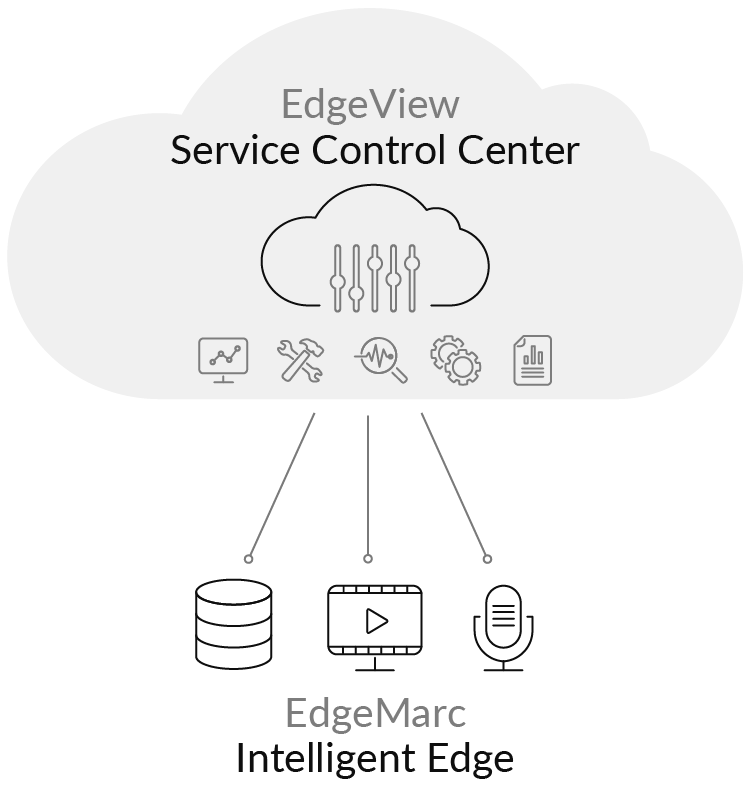 The EdgeMarc Intelligent Edge™ device is the brains behind the Ribbon SD-WAN solution. Putting the prioritization and routing intelligence at the edge of the network means that decisions can be made instantaneously and efficiently. Other SD-WAN solutions rely on packet replication across multiple WAN links, which creates overhead and potentially added costs. Ribbon SD-WAN solution provides the voice, video, and business application performance across multiple WAN connections to drive customer satisfaction. End customers will have better voice quality while experiencing fewer issues. The integration of multiple WAN links that interoperate with each other delivers better uptime and resiliency. The ability to prioritize at the application level – both by source and destination – ensures a high level of quality for mission-critical voice and data.